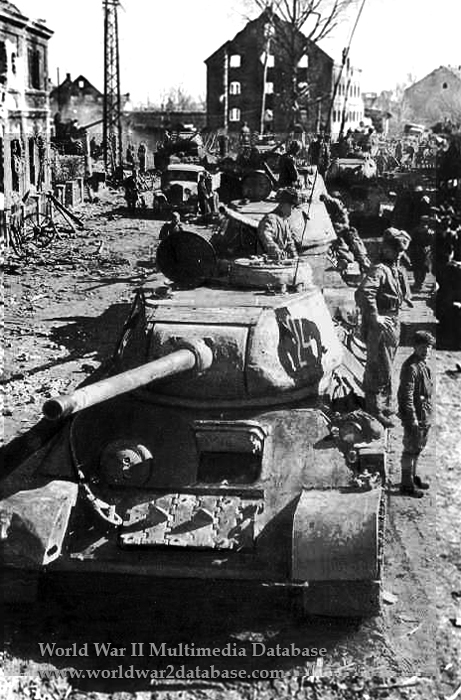 Red Army T-34/85 medium tanks of the 5th Guards Tank Army during the reduction of the Heiligenbeiler Kessel (Heiligenbeil Pocket) which destroyed the German 4th Army. As the Soviets approached East Prussia on January 13, 1945, the first German territory invaded by the Red Army in World War II, Reichskanzler (Reichchancellor) Adolf Hitler refused repeated requests to evacuate the 4th Army and civilians alike. Propaganda Minister Joseph Goebbels used Soviet atrocities in East Prussia to enflame German opinion, but this only caused a panic among German nationals in the path of the Red Army. Unknown numbers in the thousands died from artillery fire or froze to death in the snow attempting to escape. The Commander of the 4th Army, General Friedrich Hossbach, disobeyed orders and evacuated civilians and troops, and he was relieved on January 29. The next day 4th Army was ordered to stand and die on the banks of the Frisches Haff (Vistula Lagoon). Holding out for more then six weeks, these troops inflicted severe casualties on the Red Army and delayed the fall of Konigsberg to April 9, 1945. Most of the divisions of the 4th Army were down to only a single weak regiment. Their deaths meant that thousands of elite troops and two million civilians could be evacuated by sea to the West. Heiligenbeil was firebombed on March 22 and stormed by the Red Army on March 25. Most of the area was completely destroyed. The remaining Germans held out until March 29 to allow the seaborne evacuations of civilians and soldiers to continue. Heiligenbeil was renamed Mamonovo in 1946 after Soviet Commander Nikolai Vasilyevich Mamonov (September 27, 1919 - October 26, 1944) who was killed liberating Pultusk, Poland and was posthumously made a Hero of the Soviet Union on March 25, 1945, the day Heiligenbeil fell. All the surviving German residents of the town were forced to migrate in 1945-1946. Mamonovo is now part of the Kaliningrad Oblast.